Growing up in a large Midwestern city with an economy largely driven by agriculture, I thought I knew a lot about farming. I’d spent summers on my Grandpa’s century farm in Iowa, watching the corn and soy beans grow against the backdrop of the Loess Hills where my family had homesteaded. I knew I was a “city kid” but these experiences were formative and eventually led me to attend Iowa State University where I studied Agricultural Business and Administration. My formal education focused on the business and methodology behind agriculture. Studies included markets, agronomy, animal science, systems, policy, world food issues and more. I learned about market volatility and what causes it; I met Norman Borlaug (Nobel laureate and "father of the green revolution") at CIMMYT and studied the green revolution; I studied land stewardship and why it’s imperative. These items and more made me love my education and, like many fresh out of college, I graduated thinking I was finally an expert in something. That changed when I met my husband. Craig is a fifth generation Montana grain farmer and cattle rancher who has a day job selling John Deere equipment. While I had been studying agriculture, he had been living it. It is his passion and something he loves to share with those around him. Over time, Craig politely demonstrated to me that although I was versed in some higher level topics of farming and agriculture, my “Ag 101” wasn’t so hot. There are some things about farming that you simply can’t understand until you spend a few seasons on a farm and get some mud on your boots and my husband has slowly helped me bridge the gap between methodology and practice. In short: I can now drive a tractor and ear tag a calf – both things previously unimaginable. Get to Know What REALLY Goes Into Your Bread. During my four years at Great Harvest, I’ve witnessed firsthand that we live in a food trend world that demands farm-to-table products. But, now living on a farm, I’ve also noted that there is often more focus on the table than on the farm. 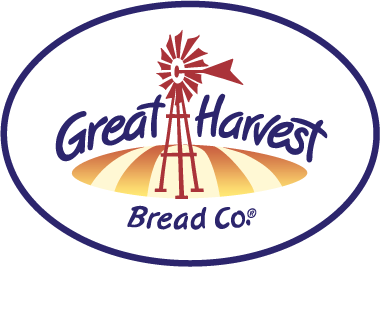 Great Harvest produces some of the highest quality artisan breads in the nation – and all of our whole grain products are made from high quality Montana wheat. Our whole grain products epitomize the farm-to-table story. 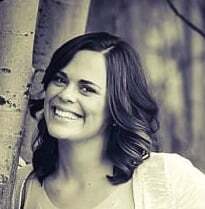 Because of my passion for Great Harvest and the new lifestyle I’ve adopted, I’ve been inspired to share my unique experience, invite you to Montana (virtually!) and put some of the focus back on the farm. Over the next year, my goal is to help you brush up on your “Ag 101” – just like I had to. In a series of posts, we’ll follow our grain fields from planting to harvest and share with you some of the ambiguities we face along the way. In the end, I hope you walk away with a better understanding of the love, passion and dedication a farmer must have to live off of the land, and can see the care that goes into your loaf of whole grain bread from day one. I want you to get to know a grain farmer a little better – and you won’t even have to get mud on your boots! 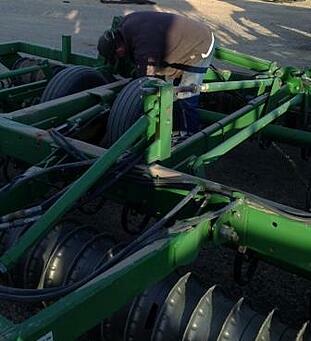 It’s springtime in Montana and that means planting. So let’s get busy! A field in spring is a blank canvas awaiting the farmer’s paintbrush. It holds in its soil the hope of prosperity and a year even more bountiful than the last. An unplanted field in spring is symbolic of hope on the horizon and a fresh new start. In Montana, longer days and warming temperatures indicate the Earth is awakening from a long sleep. Grain farmers approach their re-awakening fields with care and eagerness, but without haste. Planting is a long process that does not simply begin when the seed hits the ground. It is a careful series of appropriate crop selection, soil stewardship, machinery maintenance and long hours spent in the field. The first step of the season is deciding what to plant. This is done by looking at what was planted the year before, speculating on what the market is going to do over the next year and reviewing the resources and equipment you have on hand. A farmer must also plant what is right for his or her environment. Environments are unique across regions and a farmer will plant what works best in his or her respective climate. Microclimates exist within regions, states and even the same county. What grows in a field ten miles up the road may not grow on your farm; this is why many farmers specialize in certain crop varieties. On the Johnson Ranch, we typically grow a rotation of malt barley and alfalfa, but also occasionally raise wheat and hay barley. Our neighbors across the valley grow potatoes, but potatoes just wouldn’t work in our unique soils. Choosing to plant the right thing is the difference between bounty and disaster. It’s also incredibly important to rotate crops in different fields over time. Planting wheat in the same field year after year will diminish the nutrients in that field. Carefully rotating fields between crops ensures there are proper nutrients in the fields and also lessens the farmer’s need for unnecessary fertilizers and chemicals. Once we know what to plant, the next step is to begin cultivating the soil for the next year. 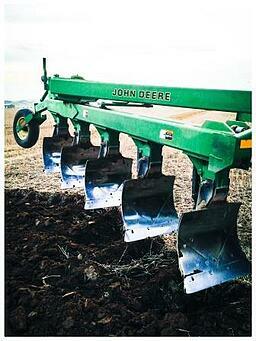 In a farmer’s arsenal of tools, soil is the most important and it must be cared for judiciously. When the field is harvested in the fall, great care is taken to leave enough organic matter in the soil so that it does not blow away or deteriorate over the long winter. When it’s worked in the spring, it must again be cautiously tended to. On our farm, we also raise cattle. The manure these cows produce provides excellent natural fertilizer for the soil. We turn cows onto our fields during the winter to graze on stubble left from the year before. While grazing, they also leave behind valuable fertilizer. In the early spring, we use special trucks to spread additional manure on the fields and allow time for the nutrients to penetrate into the soil. This sustainable practice allows us to produce cattle and crops side by side with essentially no waste. The next step is plowing. Plowing turns organic matter, manure and remnants of last year’s field back into the earth – turning nourishment back into the soil. It exposes fresh soil that will soon be ready to plant with the seeds for the upcoming season. After plowing, we run a disc across the field. A disc is an implement that softens and breaks up the large clods of earth the plow turns up. It would be nearly impossible to plant a freshly-plowed field because it would simply be too rough to run additional farm equipment over and the seeds would not flourish. On our farm, after we disc, we also land plain and colti-pack our fields. These implements are the last step in making our fields smooth and farmable, but they have an additional purpose in soil preservation. In Southwest Montana, wind storms are common and it is possible for a farmer to lose a significant portion of his valuable top soil in a single storm. These implements literally help pack the soil into the ground so it does not blow away, preserving our greatest resource. Planting is one of the most important tasks a farmer will complete in a season. It is a process requiring patience and meticulousness. 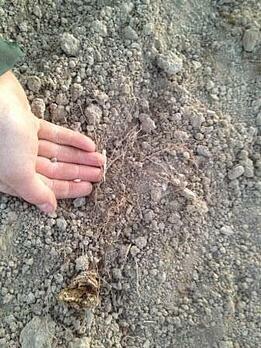 Once the seed hits the soil, there’s no turning back – so planting must be executed with great care. Planting is also referred to as drilling, and we drill our fields with a little help from some excellent 21st century technology: a GPS satellite. GPS signals help us know where we have planted, enable us to keep our rows evenly spaced and also help us avoid overlap in the field. GPS technology aides significantly in fuel economy. The more overlap you avoid in any step of farming, the more fossil fuels you conserve – which is beneficial both to the environment and to the farmer’s bottom line. Efficiency and stewardship are always goals of a good farmer. When we plant, we use a drill-down pre-emergent fertilizer. How much fertilizer and what variety to use is carefully monitored and tested. Farmers have many serious disincentives against over-fertilizing and over-spraying their fields. The first is simply cost – commercial fertilizers and sprays are very expensive and erode the farmer’s bottom line. Another is that there is a point of diminishing returns where too much fertilizer can actually harm a field and burn the soil. We choose as often as possible to use natural fertilizers (such as manure) over commercial ones. Ultimately, farmers' health and safety directly correlate to their fields and we want to expose our fields and our bodies to as few synthetic chemicals as possible. 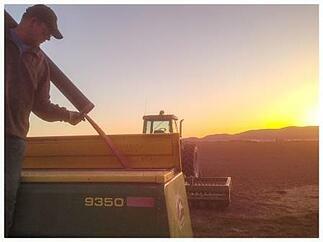 This year we began planting our fields around May 15 and wrapped up in early June. 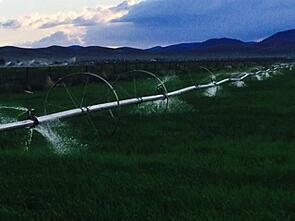 We experienced some spring rains that kept the fields too wet to tend and caused delays. The grains we planted this season are malt barley, hay barley and wheat. Craig and I can’t wait to see how they grow and we’ll have more to share with you in a couple weeks! In the meantime… things are starting to pop up! 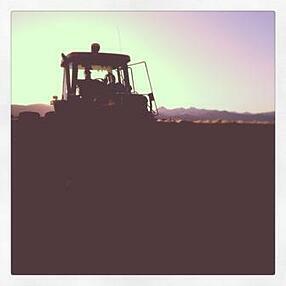 You can follow our farm’s progress on Instagram under the hash tag #johnsonfarmsdilmt. For more information about how Great Harvest sources our grain, read this post.